Using R-PACE financing for new construction could bring make net zero energy homes cost equivalent to standard homes. The Rocky Mountain Institute shows how this enticing idea could work. The U.S. residential real estate market is booming, with new home sales steadily rising over the last few years. In March 2017, over 621,000 new single-family homes were sold at a median sales price of $345,800. Imagine if most of these new home developments were net-zero energy (NZE), which not only delivers the homeowner annual energy savings but also enhances the overall performance, comfort, and resilience of these homes. Now suppose residents could afford these high-performance NZE homes at no additional up-front cost using an innovative financing tool that would annually save them more money than they pay toward the financing. Rocky Mountain Institute’s (RMI’s) latest insight brief, R-PACE: A Game-Changer for NZE Homes, shows how this dream scenario can be made a reality through a special application of residential property assessed clean energy (R-PACE) financing—a game-changing financing mechanism that has already financed over 158,000 energy and water efficiency retrofits in homes in California, Florida, and Missouri since 2008. NZE homes are smart single-family homes that produce or procure enough zero-carbon renewable energy to offset their annual fossil-fuel energy consumption. These homes present the U.S. real estate sector with an incremental $33 billion market opportunity by 2037, which will not only bring additional investment to the sector and create local jobs but also transform the market trajectory overall. As policymakers decide on their strategy to build smarter cities and revitalize their aging infrastructure, they must consider the unprecedented opportunity to invest in high-performing NZE new homes, which are more comfortable, affordable, and resilient to power outages and weather extremes. Scaling NZE homes through concerted policy efforts will not only help states and local governments meet their carbon goals but also improve the housing stock and real estate values. 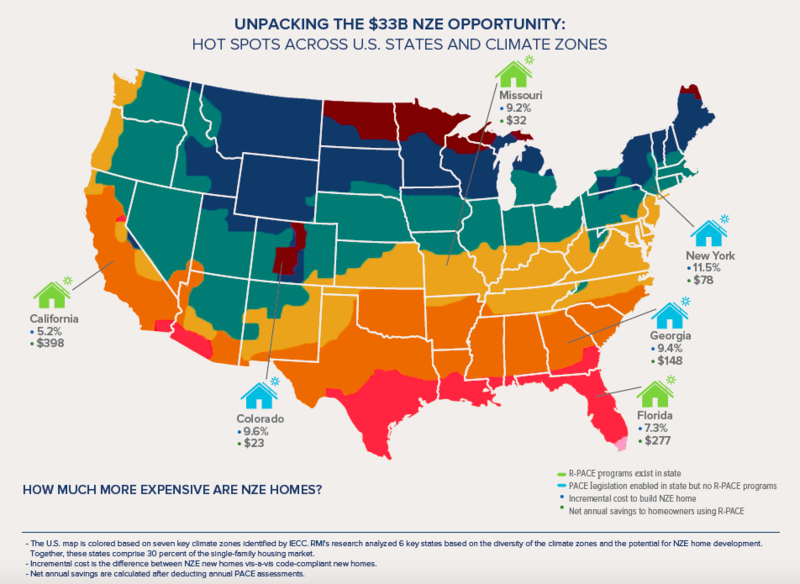 Overall, NZE homes are the next big frontier for innovation and competition in the residential real estate market, and they promise a future that is propitious not only for homeowners and real estate developers but also for the U.S. economy and the planet. What Are the Market Barriers to Scaling NZE Homes? While the market potential and business case for investing in an NZE home is compelling for both the builder and the homeowner, the up-front incremental cost of developing a new NZE home has been the biggest deterrent for builders and developers looking to invest in NZE development to make it mainstream. According to Rocky Mountain Institute’s research, the average incremental up-front cost of constructing an NZE home is likely to be $24,811 more than an average code-compliant new home (excluding the federal investment tax credit and other state-specific incentives). This estimate was derived by analyzing average code-compliant single-family homes across California, Missouri, Florida, New York, Colorado, and Georgia, which collectively comprise almost one-third of the existing single-family housing market. Builders, who control almost three-fourths of this market, have been unwilling to invest their equity up front during the home construction process since they do not directly benefit from the operational cost savings and have no incentive to maximize them. The misaligned builder incentives and weak market signals coupled with the valuation uncertainty of how NZE home energy performance is presently valued by the market players are some of the main reasons for the latent consumer demand for NZE homes. We believe that enabling R-PACE for new construction is an effective way to overcome these market barriers and scale NZE new construction around the country. What Is Residential PACE and How Can It Help Scale NZE New Construction? Residential PACE, also known as R-PACE, is an innovative financing mechanism used specifically to finance energy efficiency, renewable energy, resilience, and water-saving home improvements. This assessment is typically attached to a property’s tax bill, secured by the same type of lien against the property as tax bills, and repaid through property taxes. It is unique because unlike traditional mortgages, it is transferable upon sale of the property and is tied to the property rather than the property owner. This feature allows seamless transfer and resolves the builder-homeowner cost-benefit split incentive challenge by lowering the need for builders to invest their capital equity into the project. RMI’s research confirms that an R-PACE financed NZE home is also a great investment for homebuyers as it allows them to own a home at the same up-front cost while earning more annual cost savings than the amount they pay for the annual PACE assessments, yielding average net monetary benefits of $160 year-on-year. Thus, R-PACE can enable U.S. homes to be more resilient, affordable, innovative, efficient, and high performing while costing less than an average home. How Can We Enable Residential PACE for New Construction? RMI is working toward a future where every homeowner in the U.S. has the opportunity to buy an NZE high-performance home for the same up-front cost as an average home while accruing net cost savings on the investment annually. This dream can be a reality if we use R-PACE to finance the incremental up-front costs to scale NZE homes in our states, cities, and communities. RMI appeals to states and local governments to work together to enable R-PACE for new construction in their jurisdictions to scale new NZE developments and make a concerted effort to facilitate enabling policy design and stakeholder engagement to support the mechanism. This effort would not only promote innovation and development in the real estate sector, but would also help leverage the abundant solar potential in states, encourage more local job creation, and increase employment overall. This is a win-win market-based solution with a business case for states, local governments, developers, and homebuyers across the country. We believe that R-PACE, when thoughtfully deployed for NZE home construction with robust state-level consumer protection measures, will scale NZE home development and set an example for other states to emulate. If you share this dream, we look forward to working with you. You can reach us at financethefuture@rmi.orgto learn more about our work on R-PACE for new construction. 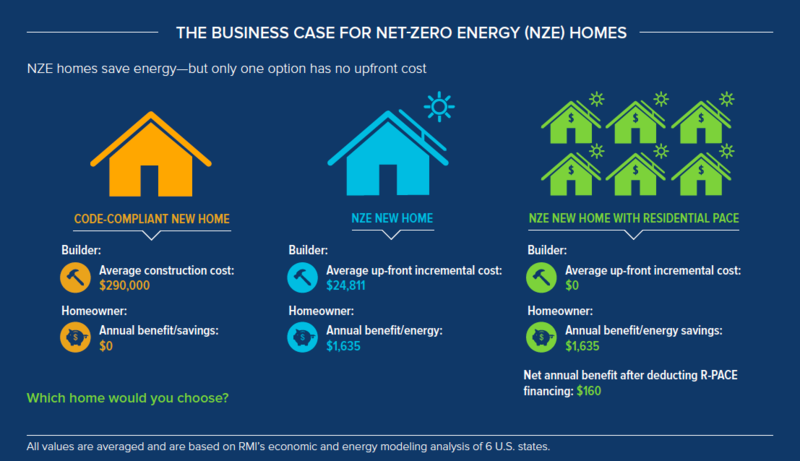 Download the new insight brief, R-PACE: A Game-Changer for NZE Homes, to learn more about the opportunities for state and municipal leaders and policymakers to adopt innovative residential PACE programs as a means to deliver high-performance, net-zero energy (NZE) homes at no additional up-front cost.